Colourful, refreshing and delicious, there are a million reasons to love sangria. It's our go-to drink on a hot summer day, perfect for an alfresco gathering, and just the thing to serve during a festive brunch. Before getting all creative with your summer sangria recipes, getting the classic version down pat is important. This red sangria recipe blends red wine, fresh oranges, brandy and lemon for a refreshing adult beverage. Can't choose between a margarita and a sangria? Make both! This beautiful summer sangria recipe blends zesty citrus with strawberries, sauvignon blanc and tequila. Aren't the edible flowers the most adorable garnish? Here's the full recipe from The Inspired Home. Rosé wine is an excellent way to add a twist to classic sangria. Blend it with berries, strawberry-flavoured vodka and lemon-lime soda. Here's the killer recipe from Jennifer Meyering. Pineapple, orange and kiwi are a fun way to kick up a summer sangria. This recipe from Lemon Tree Dwelling calls for sweet white wine, such as moscato, and Malibu rum. Want to get more creative in the kitchen? 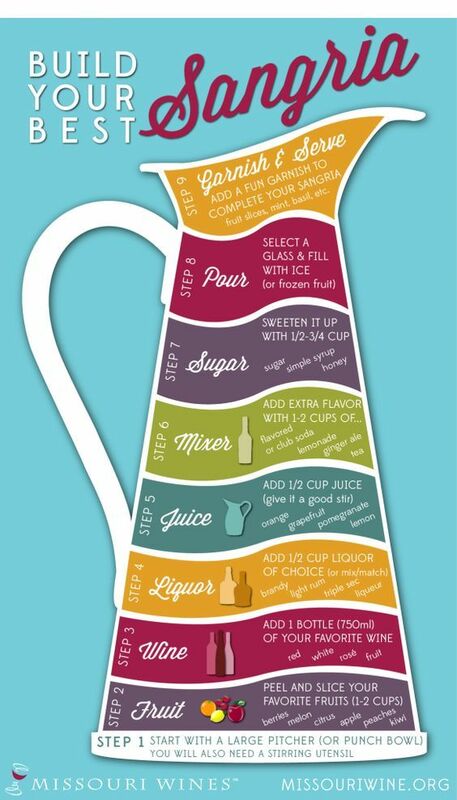 Use this nifty guide from Missouri Wines to mix up different batches of tasty sangria. You can get as crazy as you want. Cheers!